It’s very likely that the y-o-y growth will continue to decelerate, simply because growth was very high during October last year—as on 10 October 2008, y-o-y growth was 29.4%. However, this need not be reason for concern because of the profusion of alternative means of financing, especially through the capital markets. For instance, during the June quarter, according to data from market research firm Prime Database, the amount of privately placed bonds was up 42% y-o-y. 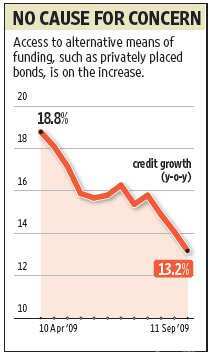 Similarly, external commercial borrowing sanctions were around $2 billion (Rs9,600 crore now) each in June and July, although that fell back to about $1 billion in August. Companies are also mopping up millions through qualified institutional placements. Liquidity with banks continues to be abundant, with the credit-deposit ratio at 68.8% on 11 September. But deposit growth was very low during the fortnight to 11 September, as a result of which the incremental credit-deposit ratio between 14 August and 11 September was a high 80%. This was one reason for the hike in bond yields in mid-September.